My father's mother's family were German Americans who had connections to both Red Hook Brooklyn and Hoboken, New Jersey. My husband Tom's father's family were also German Americans who had connections to Red Hook, Brooklyn and Hoboken, New Jersey. In addition several of the men in these two families serviced in the German merchant marines. My great grandparents, Bernard Petermann and Sophie Steuer, came from Oldenburg, Germany. They immigrated to the United States circa 1882. Their first stop in this country was in the Red Hook Section of Brooklyn, New York where they were living at 189 Conover Street when their son, Christian August Petermann, was born on April 6, 1883. The Petermanns moved to Hoboken, New Jersey by July 1884, when their son, Wilhelm, was born. Tom's great grandparents, Fritz Kettler and Johanna Peters, immigrated from Friesland and Norway circa 1882. Their first stop in this country was the Red Hook Section of Brooklyn, New York, where their daughter, Marie Sophia, was born at 206 Richard St. on February 21, 1886 and their daughter, Gertrude Friderike, was born at 87 Ferris St. on April 11, 1889. They were in Hoboken, New Jersey by the November 29, 1891 birth of their Frederick. Red Hook, part of Ward 12, is a relatively small neighborhood. The area that both the Kettlers and Petermanns lived in encompasses three city blocks from Ferris to Richards between Partition (now Coffey) and Dikeman. The north sourth streets run: Ferris, Conover, Van Brunt and Richard. All of the known address for the two families were between the two east west streets of Partition (now Coffey) and Dikeman. The births of Christian Petermann, Marie Kettler and Gertrude Kettler were ALL reported by the German born midwife, Mathilda Ruppanner. Certainly Mathilde Ruppanner had at least met Hannah Kettler and Sophia Petermann if not actually delivered their babies. Both fathers, Bernard Petermann and Fritz Kettler, worked on the docks. Did the Petermanns and the Kettlers know each other in Brooklyn? The Petermanns and the Kettlers lived in the German section of Hoboken. While this section was bigger than Red Hook, Brooklyn (and I don't have overlapping dates for these two families) they were never listed more than a few blocks apart. The Petermann girls, Meta born 1886 and Annie born 1887, were close in age to the Kettler girls, Marie born 1886 and Gertrude born 1889. They were most likely at school together. The family of Tom's great grandfather, Henry Blanck, and the family of my great grandfather, Bernhard Petermann, lived on the same block of Willow street, Hoboken in 1887. 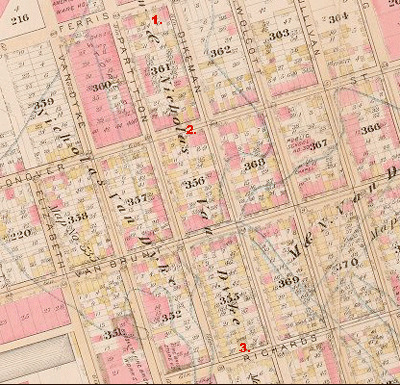 The 1881 map of Hoboken shows only a few houses on this block which is between Ferry (now Observer Highway) and Newark Street (near the railroad tracks). The Blancks lived at 43 Willow from at least December 1882 until at least May 9, 1887. In 1887 the Blancks had 5 children: Minnie, age 15, John, age 12, Herman, age 10, Henry, age 5, and Louis, an infant born May 9, 1887. The Petermans were at 101 Park Avenue in June 1886. They lived at 65 Willow from at least October 1887 to at least 1891. (Bernard Petermann was listed in the 1892 city Directory at 65 Willow.) In 1887 the Petermanns had four children: Johann, age 8, Christian, age 5, Meta, age 1, and Annie, born October 24, 1887. Both fathers were around the same age, 39/40, but Minnie (Melusine) Erxmeyer Blanck was 11 years older than Sophie Steuer Petermann. They were all German speakers. Both women had babies in 1887. The P. O. (or medical attendant) reporting the births were NOT the same. Did the Petermanns and the Blancks know each other when they lived on Willow Avenue in Hoboken? If both families were living on the 43-65 block of Willow in the summer of 1887 they certainly would have followed the old custom (in the days before Air Conditioning) of sitting on the stoop on a hot summer's eve. If both families were living on the 43-65 block of Willow in the summer of 1887 it is highly likely that the boys, Johann Peterman, age 8, Christian Petermann, age 5, Herman Blanck age 10 and Henry Blanck, age 5, played "Stoop Ball", Kick the Can", Hide and Seek" or some other game together. If both families were living on the 43-65 block of Willow in the summer of 1887 new mother, Melusine, may have commiserated with pregnant mother, Sophie, about the travails of carrying a baby though the hot summer months. Were both families on the block in the summer of 1887? I do not have another certain address for the Blanck family until the 1900 census. Did the move between May and and October 1887? Probably not. A rather strange custom was in effect in 1887 - the May 1st Moving Day. Going back at least to the late 1700s it was traditional for leases to expire on May 1st. This meant that pretty much everyone who would rented their accommodations (be it housing or offices) would move on May 1st. If the Blancks had a baby on May 9th chances are they did not move until at least the next May 1st. Consequently, it is highly likely that the Petermann and Blanck families at least traded pleasantries during the summer of 1887, if not longer. In 1906, my grandfather, Percy Land (born 1885) lived at 328 Hudson Street (between 3rd Street and 4th Street), and worked as a carpenter in Hoboken. In 1907, Tom's grandmother, Gertrude Kettler (born 1889) lived at 253 Third Street, four short blocks away from where Percy Land lived in 1906. I do not know how long either of them stayed at these addresses. John Blanck, born 1875, was a lumberman in a lumber yard. Herman Blanck, born 1877, was a carpenter. Louis Blanck, born 1887, was a driver for a lumber yard and a lumberman. Did either Gertrude Kettler or one of the Blanck brothers know Percy Land? Base on where they lived in Hoboken the Blanck, Kettler, and Petermann children would all have attended School No. 1 throughout most of their education. The 1887 Quarter-century's progress of New Jersey's leading manufacturing center reported that Hoboken had four public schools located as follows: No. 1, Garden street, near Third; No. 2. Garden street, near Tenth; No. 3, Adams street, near Second; No. 4, Park avenue, near Sixth. According to the article in the Smithtown Long Island Newspaper in the 1930s, Meta Petermann Land and her sister, Anna Sophie, and friends went to public school No. 1. Located on Garden near 3rd, School No. 1 was originally built on land left to the city by Edwin Augustus Stevens. The original school was a three story brick building heated by a pot belly stove in each classroom and lit by gas light. In the 1880 and 90s the school was very crowded and space was rented at the German Church on Garden Street below Second Street to accommodate the overflow of students. Sometimes there were as many as a hundred students to one class room. Wilhelmina Blanck was the oldest child in the three families in question. Born in 1872 she may have started school in Hoboken as early as 1877. If she stayed in school until age 14 she would have finished circa 1886. Christian Peterman born 1883 and Henry Blanck born 1882 were of similar age. Marie Kettler and Meta Petermann were born the same year - 1886, but I do not know if Marie Kettler lived. Sophie Petermann and Louis Blanck were the same age, both born in 1887. They may have started in 1892. If they stayed in school until the were at least 14 they would have been in school until 1901. If Henry Kettler born in 1894 stayed in school until he was 14 he would have left in 1908. Some of these children must have had at least nodding acquaintances. Meta Petermann was my grandmother. Louis Blanck was my husband's grandfather. Many young men who lived near the major German seaport of Bremen when to sea. The Erxmeyer brothers, Friderich and Heinrich, their future brother-in-laws, Henry Blanck and Johann Lehman, and J. Berend Petermann all served with the merchant ships out of Bremen. They all ended up living in Hoboken, New Jersey. J. Berend Petermann served at sea for over 14 years and made many voyages around the world. Between Febuary 5 and July 25 1872 he served as a helmsman on the steamer Graf Bismarck a ship that for several years made regular runs to the "West Indies". Enlisting on the same day and serving for the same period of time was Johann Lehman. The ship had a crew of at least 92 men. Berend Petermann was a helmsman. Johs. Lehmann was a steward. During more than five 5 months on the ship together they must have had some interaction. Later they both lived in Hoboken. Johann Lehman married Julia Erxmeyer. Julia was the sister of Melusine Erxmeyer who married Henry Blanck. Henry Blanck had also been at sea. Henry Blanck, John Leham and Berend Petermann had children of the same ages who would have gone to the same schools. They all lived in the same area of Hoboken. Did John and Berend run into each other in Hoboken and reminisce about old times in the West Indies? Could Johann Lehman have introduced his sister-in law, Melusine and/or brother-in-law, Henry, to his shipmate Johann Berend Petermann and his wife, Sophie? Did Henry and Melusine meet Berend and Sophie Petermann though the common acquaintance of Johann Lehman? The Blanck, Kettlers, Petermanns and Lands did not attend the same churches. The Blanck records were found at the the German Luterran Church at 6th and Garden. I have not found Kettler records in any church before the marriage of Gertrude Kettler to Louie Blanck. The Petermanns were connected with St. Matthews Evangelical Lutheran at 8th and Hudson where Meta Petermann made her confirmation. The Lands were from England via Canada and were Methodists and Presbyterians.